A teacher was attacked and arrested for legally asking why the school board was getting a raise as the schools fall apart and class sizes grow. 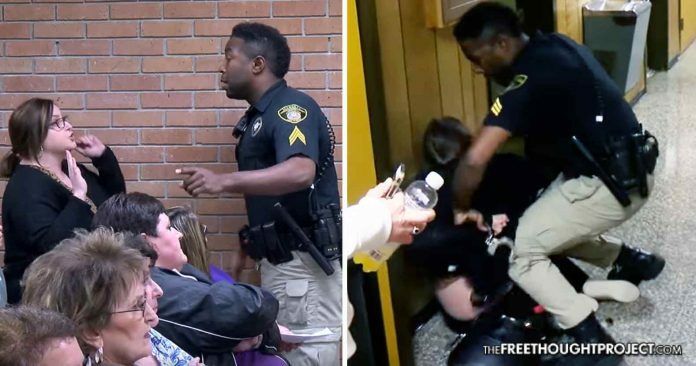 Vermillion Parish, LA — Illustrating the brutal nature of servitude police have to their rulers, an innocent English teacher was assaulted and arrested this week for merely asking why the superintendent was getting a raise when the rest of the school system is suffering. The entire infuriating interaction was captured on video and serves to make a powerful statement about who police protect. During the time for public comment, Hargrave was called upon to speak, stood up, and very eloquently and calmly voiced her concern that classroom sizes have greatly increased over the last few years as teachers’ salaries remained stagnant. Hargrave explained that they need more resources at the teaching level and watching an unelected new superintendent get a massive raise because of who he knows was disappointing. The board headed up by president Anthony Fontana—a local defense attorney often referred to as a “tyrant”—couldn’t have cared less about Hargrave’s concerns. Still, Hargrave sat peacefully as the board voted themselves a massive raise in front of all the suffering teachers. After the vote, Hargrave was given the floor again and was being addressed by superintendent Jerome Puyau—who was likely giddy over his new $38,000 raise—when, for no reason, a city marshal’s deputy approached Hargrave to remove her from the room. Puyau was actually talking to Hargrave when this cop demanded she exit the building for absolutely no reason. “I hope someone is getting this on film,” an audience member can be heard saying. Despite having every legal reason to stay, Hargrave complied with the officer and left the meeting even though Puyau was still talking to her. As the camera turns, we can see the cop on top of Hargrave, who is much smaller than him, as he places her under arrest for no reason. As the cop leads Hargrave to the patrol vehicle to take her to the station, bystanders speak out in protest. Still, the officer proceeded to arrest the young teacher for no reason. As he waits for a backup officer to arrive, the marshal looks like a fool and a tyrant as he stands there, detaining this harmless and innocent woman. Below is a video of what standing up for children and calling out corruption looks like in the land of the free. To see the full interaction, watch the video below.